File this one in the insane file. Sure a Nur is a rare car. 750 cars. Millennium Jade- according to the GT-R Registry - 156 cars. However this car is not a good example. 337,000 km. Thats 209,000 miles. Which for a car in Japan, seems like it should be a million here. The car needed an engine rebuild, had some rust, had burn holes in the seats. In other words, it was a bit beat. 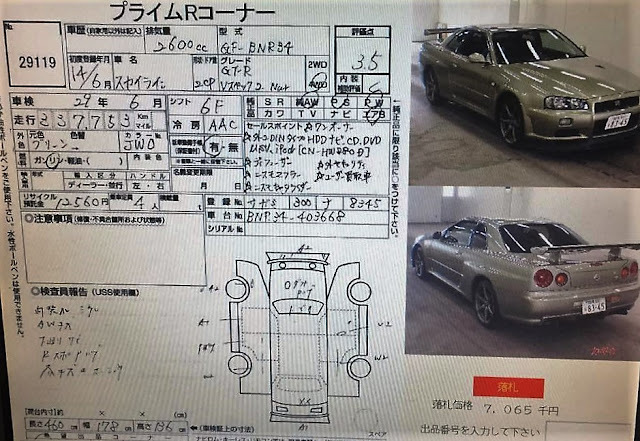 Sold for 7.065 million yen at auction. Or depending on the exchange rate about $65,000. So anyone want to bet that R34 GT-R's won't be $100k in the US in 2024?